To help you on your way to a wonderful Thanksgiving, check out this Holland House recipe for sweet potatoes featuring their Marsala Cooking Wine. To make this dish dairy free and vegan, use a buttery spread instead of butter. Instead of whipping cream, use coconut cream (not coconut milk). 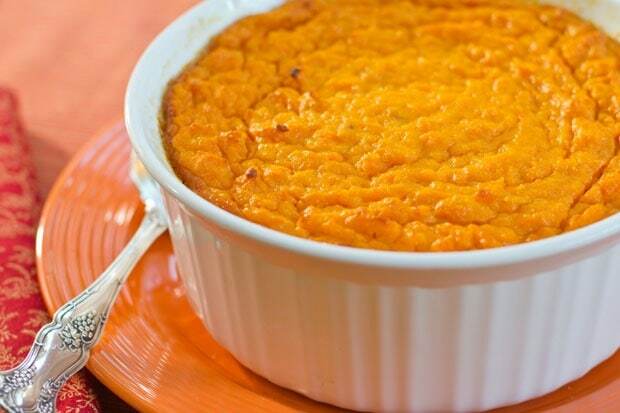 Whipped sweet potatoes may be made a day ahead and refrigerated. Reheat in microwave, covered, on medium power. Stir occasionally. Fill a 6-quart pot halfway with water. Peel each potato and place in pot to prevent browning. Cut potatoes into 1-inch cubes and return to pot. Drain water so there is enough just to cover potatoes. Stir in salt. Cover and bring to a boil. Boil 10 minutes or until potatoes are soft. In a small microwaveable bowl or 1-cup glass measuring cup, heat marsala cooking wine in microwave 1 minute on medium power or until very hot. Stir in butter, vanilla, cinnamon, nutmeg and orange peel. When potatoes are cooked, drain water from pot. Add marsala cooking wine mixture to pot. Whip with electric beater until smooth. Stir in cream, if desired. Keep warm until ready to serve. Disclosure: Mizkan, the parent company of Holland House, provided compensation for this post. All opinions are my own. Posted in Gluten Free, Recipes, Thanksgiving, Veggies and tagged dairy free, potatoes, vegan on November 21, 2011 by Anne-Marie Nichols.